In 2012, Michigan consumed over 210 billion gallons of water. That may sound like a lot, but according to the Michigan Department of Environmental Quality (DEQ), only five percent of the total water withdrawn from the Great Lakes Basin is consumptive in nature – that is, it’s not returned to the water cycle. The fact is, Michigan is blessed with enormous supplies of fresh water, and according to the U.S. EPA, the Great Lakes account for a staggering 84 percent of the entire nation’s freshwater supply. With that said, it is still incumbent upon all of us to use our water resources wisely, and to make sure that our consumption of a precious resource is done responsibly. Recently, activists who ideologically oppose oil and natural gas development have disseminated misinformation about the industry’s water use. One activist group says hydraulic fracturing in Michigan is “water intensive beyond anyone’s imagination.” The Sierra Club references “extreme water withdrawals associated with fracking.” Environment Michigan warns of “water depletion” due to hydraulic fracturing. Instead of activism, we believe it’s more useful to reference facts and full context about water use. 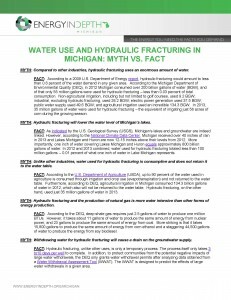 So, to help separate fact from fiction, EID has developed a one-page fact sheet regarding some of the biggest myths regarding the oil and gas industry’s use of water in Michigan, compared appropriately with what reality actually tells us.